Yes, A Big Mooncake for Little Star really was awarded a Caldecott Honor. I'm still trying to believe it myself. So, on the morning of the awards, I turned the ringer on my phone (another thing I rarely do!). I did think of it often, but luckily the daily chaos of getting my daughter to school, etc. made it impossible for me to wait by the phone! Around 9:30 EST, there was still no call, so I resigned myself to being unmentioned and thought, “So glad I booked that massage!” and continued with errands, slightly sadly. About 15 minutes later, my husband and I were walking out of our local grocery store, when my pocket started ringing. I think I said, “Oh, my gosh!” and my husband said, “Oh! Awards committee!” and it was! So, we were outside on the sidewalk-- in front of people coming in and out of the store and in front of traffic and dirty snowbanks--when the committee told me I had won the Honor. 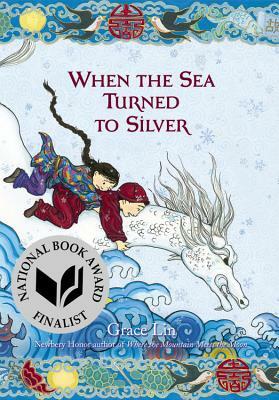 I kept thinking, “Is this for real?” and then I started tearing up because it was for real, and not a dream, even though it was a dream I’d had for so long. I actually got off the phone with the committee as fast as possible because I was crying and I was embarrassed! Obviously, I am THRILLED. 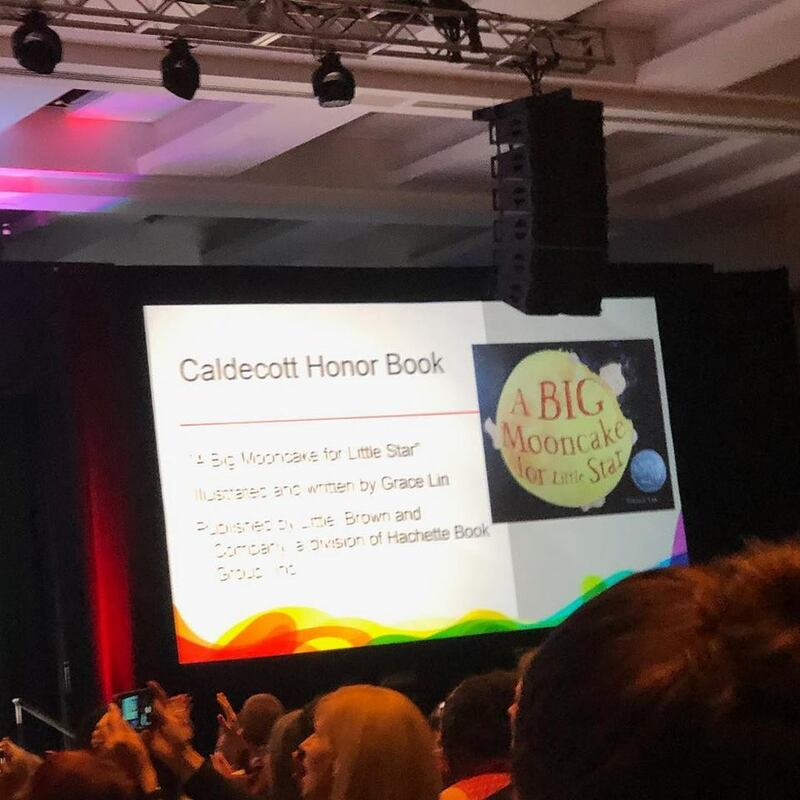 This book means the world (and the moon) to me and I'm so honored that it will now find it's way to more small hands and hearts. 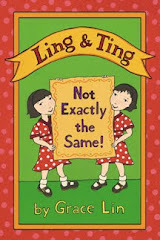 Book Chat with the Illustrator: Grace Lin on A BIG MOONCAKE FOR LITTLE STAR from LB School on Vimeo. It's time to announce the winners of my scarf giveaway!!! Hooray for the winners! Congratulations to the winners! 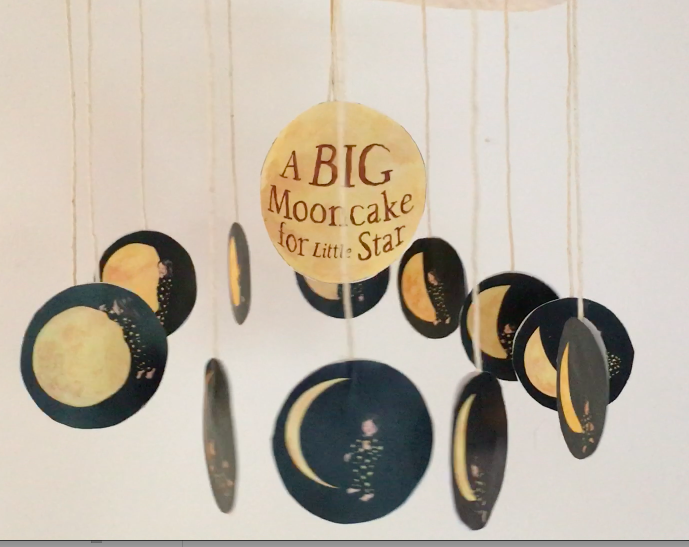 Some people have lamented that I didn't include a mooncake recipe in A Big Mooncake for Little Star. There's a few reasons why I didn't-- there wasn't really enough room in the book to fit it in and mooncakes are pretty difficult to make. I actually don't know anyone (not even my grandmother) who actually makes mooncakes, everyone I know just buys them. 1. In a large bowl, mix golden syrup, water picture, vanilla and old, then add flour. Mix gently. Knead the dough for a minute and set aside for 40 minutes. 3. On a floured surface, roll the dough into a cylinder (1 inches in diameter) and cut into 12 equal pieces. 4. Roll each piece into a ball and flatten with your hand to make a small circle, not too thin. 5. Place a large rounded spoonful of the red bean pasties the center of each dough circle, wrap it, in the seams, then gently roll it into a ball shape. 6. Place each ball in the mooncake mold and press. Transfer the mooncakes to a baking sheet. 7. Bake the mooncakes for 7 minutes, remove from the oven and brush on the egg wash with a baking brush. 8. Place the baking sheet back int he oven and bake for another 5 minutes, until golden brown. Let sit for 10 minutes, the remove from baking sheets. *See all the Mooncake Activites I have available HERE! And don't forget to share a photo of A Big Mooncake for Little Star on twitter* or instagram* with the #BigMooncake4LittleStar and to win one of these scarves! 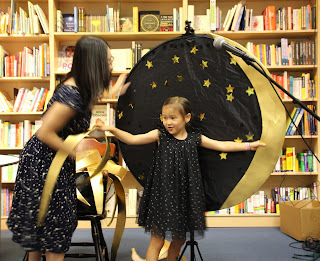 If you came to my book launch (thank you so much for coming! ), you would have seen the real Little Star and I do what she calls "The Show." The Show is really just a little interactive readers' theater that you can do yourself! Below is the downloadable script. 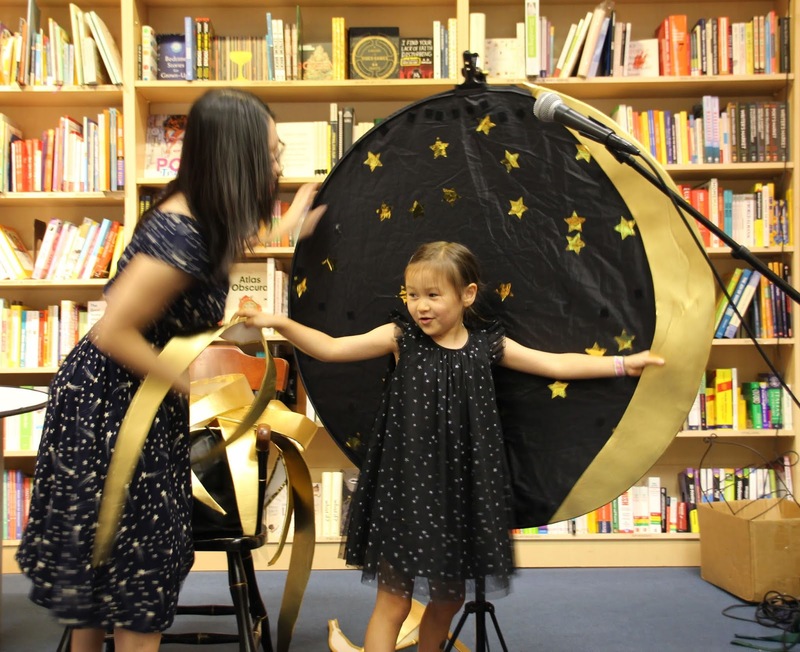 On the opening pages, Mama and Little Star are making a Big Mooncake in their kitchen. 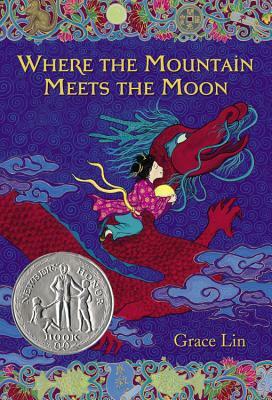 Here are some suggested ways to involve your read aloud audience from endpaper to endpaper. This activity allows you to remove (and nibble) the phases of the moon just like Little Star. This activity pairs well with the Reader’s Theater. Make a Big Mooncake Phase Viewer! Spoiler! 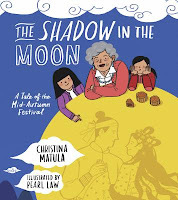 In A Big Mooncake for Little Star someone is making the moon change shape! Thanks to the brilliant minds at Curious City, you, too, can do it. Using the download and these instruction make your own Moon Phase viewer! See all the Mooncake Activites I have available HERE! Make the Little Star Mobile! 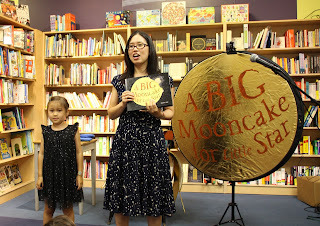 A Big Mooncake for Little Star came out yesterday and I'm still celebrating! 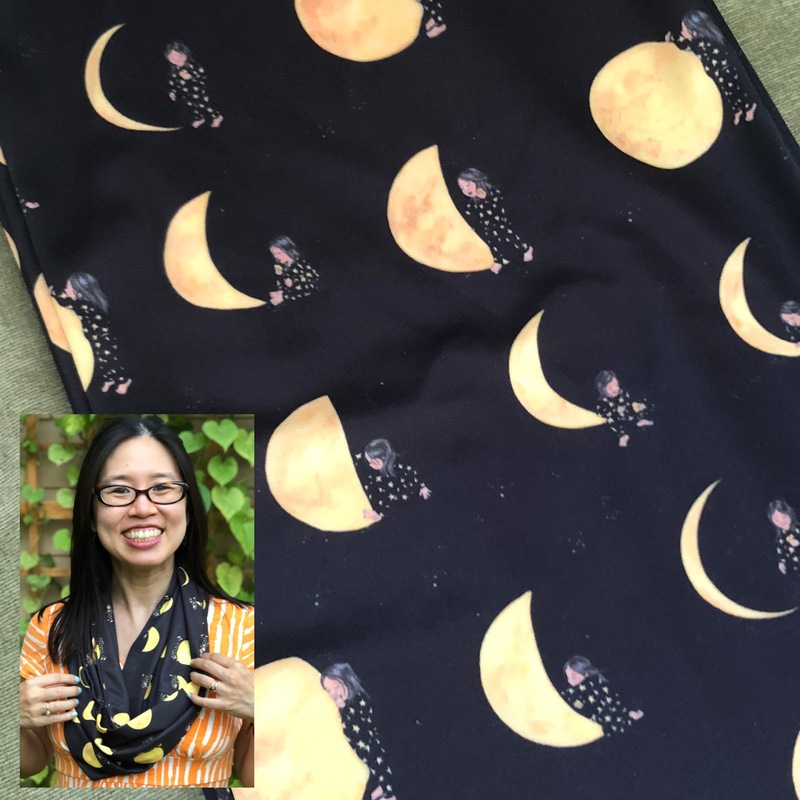 In fact, I'll be celebrating all the way to November when I announce the winners of the those Little Star Moon scarves! 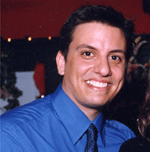 Want to make your photo extra special? Or just want to beautify a room? How about a Little Star Mobile? Yes, with help from the genius minds of Curious City, you can download instructions to create this adorable Little Star mobile! Click HERE for the download the Little Star Mobile craft. Happy Birthday to Little Star! Today is the day! A Big Mooncake for Little Star is now available! To celebrate, I had 8 lovely (even if I do say so myself) infinity scarves made with art from the book! And one could be yours! All you have to do is share a photo of A Big Mooncake for Little Star on twitter* or instagram* with the #BigMooncake4LittleStar and you are entered into a random drawing! Brownie points given to those most creative (and tag me @pacylin)! Winners announced here 11/20/2018!! !